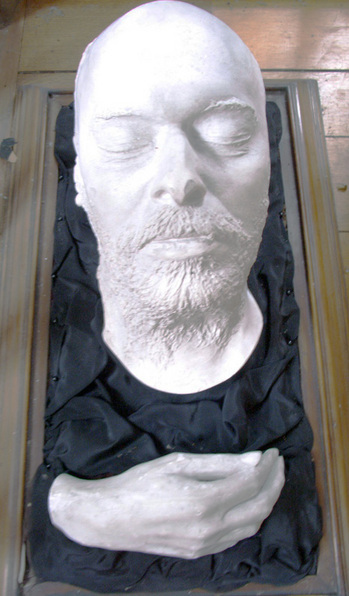 Death mask of Dante Gabriel Rossetti (1828-1882), from the original by Domenico Brucciani (1815/18-1880) in possession of W. M. Rossetti. Previously owned by Janet Camp Troxell. Referenced in Princeton University Library Chronicle vol. 33, no. 3, p. 173. The English poet and painter Dante Gabriel Rossetti (1828-1882) was in poor health during the last years of his life, particularly after being cut-out of the Kelmscott decorative arts firm by William Morris (1834-1896). He was addicted to chloral hydarate, which he had begun taking to cure insomnia. In December of 1881 Rossetti suffered a mild stroke that left him largely paralyzed and on Easter Sunday, April 9, 1882 he died. The cause was listed as Brights Disease (kidney failure). His friends not only had a death mask made by the leading plaster caster of the time, Domenico Brucciani, but also a cast of his right hand. A directory of British bronze sculpture founders and plaster figure makers has been mounted by the National Portrait Gallery, London. Under “B” you will find a complete history of the Brucciani family’s plaster cast business and Domenico’s work as a Formatore or modeller for what is now the Victoria and Albert Museum and the British Museum.